The SCHADE supply package comprised two tripper cars for the coal-fired power plant and four for the steel plant. Each of them has a capacity of 4600 tph. In addition Ha Tinh took delivery of six semi-portal reclaimers, with rail spans of 40.7 m and a reclaim capacity of 2000 tph each. In the steel plant, a portal reclaimer with a rail span of 48.5 m and a capacity of 1200 tph will be used, alongside two stackers with capacities of 300 tph and 3200 tph respectively. 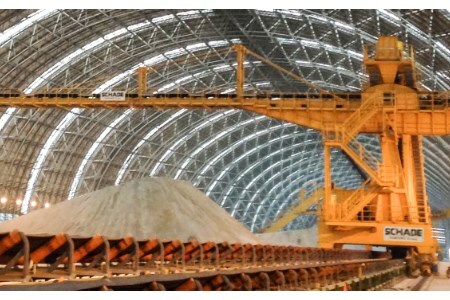 In the first stage of completion, Ha Tinh will produce around 5 million t of steel per year. A two-phase expansion will follow, with production capacity initially increasing to 10 million t and then reaching up to 22 million t of steel per annum.